Login and My Account – click on your name to access a list of your applications, check your subscription and storage, manage your login details, access User manual or log out. Ribbon – In tabs you can find different map tools. Click here for additional info. 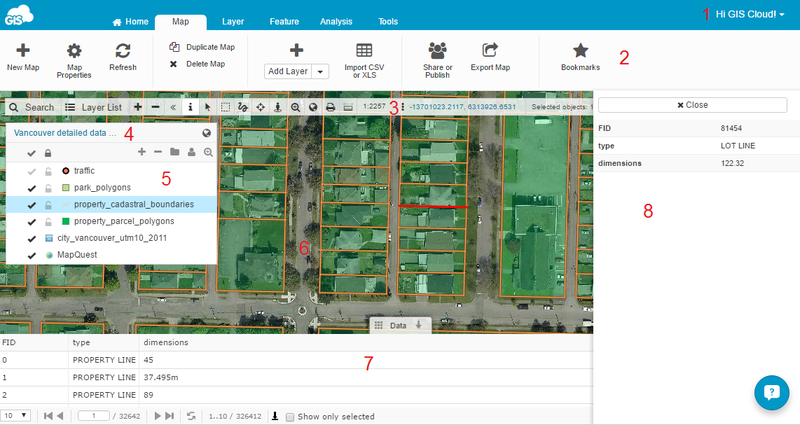 Toolbar – tools for basic operations with maps. Click here for more info about Toolbar tools. Map Name – Click on map name to refresh the map and display map URL in address bar of the browser. Layer List – List of all layers in the map. Click here for more info. Data Grid – Table with attribute records and fields of a selected layer. Info Panel – Attribute info about selected feature or edit attributes and geometry or delete features from the database layers.